Concering the spatha from Krefeld-Gellep, I think Paul means the one from grave 43? I do have several photo's of that sword somewhere (as well as the other one with the cloisonné pommel ), so in case anybody needs more details, feel free to PM me. A belt buckle and spurs. 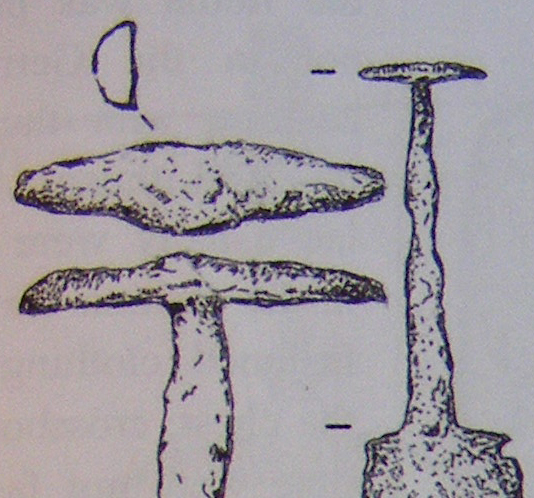 A whetstone,spears and shield umbo. Proud to be where I was born ! No problem :-). If someone needs a better quality photos,please PM me. I just want to say this is a great thread, I really learned a lot reading this. And thanks for your kind words, Jean Henri! Now I really see some different stuff! 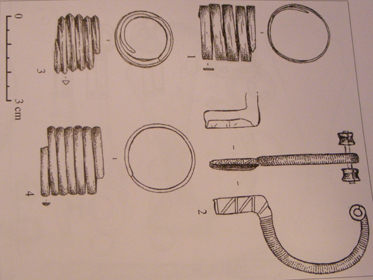 The rings/bracelets and fibula for example. We don't have a lot about Lithuania in our library here. The Axehead is also interesting. But it's such a lovely country, two years ago I was in Trakai for the tournament. Awesome landskape and castle! Concerning the hilt and scabbard of these swords, I have posted some pics from Nydam on the first page of this topic. Does your sword have a flat rhombic pommelcap or is it more pyramid shaped mini pommel? 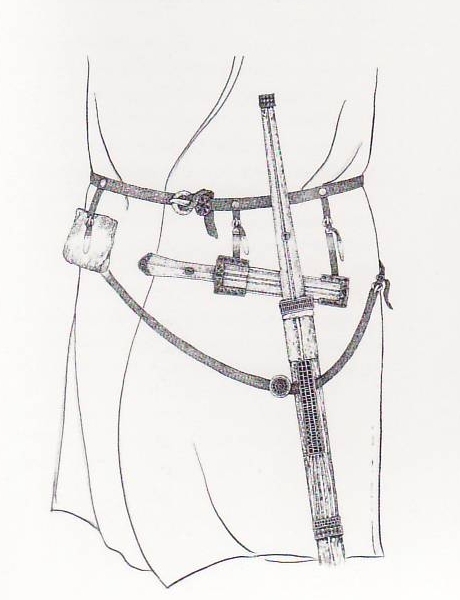 a thinn baldric would go through them and be slung across the breast and right shoulder of the carrier while the sword would hang at his left side. Greetings Till! Thanx for kind words about my Fatherland ! And the third photo is full set of sword and scabbard details.There are three small buckles and the larger one.The larger buckle is of belt.The three small ones are from baldric, is quiete sure.The smallest one buckle is for baldric catch.But I still don't understand for that are these two buchles(in situ they lie on the left and the right sides of scabbard).Any ideas? Thanks Arunas, I was also wondering about the pommel cap, so thanks for those pics, especially the last one in colour, very helpful, thanks. Although the method of assembly differs, I see a resemblance to the (very much later) baselard style hilt at first glance. Does anyone else notice the strong "H" or "I" shape, or have I not had enough coffee this morning? yes, it's the same H or I (but just not in this font style )shape, but if I remember correct, the hilts Baselards are constructed with slades riveted onto the tang. These hilts are done the classical way with the hilt parts being shoved onto the tang and secured by the riveted end of the tang. Hey Arunas! 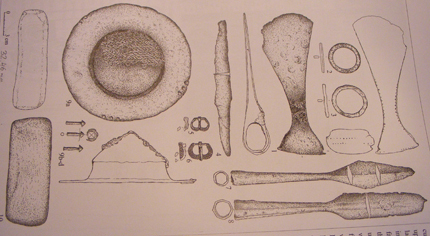 The material of the Nydam hilt is horn according to C. Engelhard ( the excavator) but in the museum in Schleswig they have a replica of the hilt made of antler. I have some drawings of different scabbard carrying methods but i need to go working now and can't scan them in and post them here. I will do it tomorrow. Thanx Till, I'm waiting great impatience! Here's another style of scabbard suspension from a hunnic kurgan grave in Brut/Russia (middle of the 5th century) I guess with the two buckles on each side of the slider, the sword could be detached from the belt/baldric. If this is the case, it would mean that it was directly attached to the main belt worn around the waist, but I'm not sure about it. : . Hail to You, Till ! Thanx for the exertion, but this is not this sword "style". Look at the buckles on the left and right side of scabard ,they are nearby. And the buckle of baldric is lying under. Maybe the baldric belt was rolled up around the scabbard before the puting to the grave? Any more iages about "wearing" such swords? Thanks very much Len, nice find. Yes this particular sword is nothing like any other I've seen from this period. Would anyone care to guess what the upper and lower guards made from, iron? You're welcome guys. I wish I knew more, like Stephen I saw the small picture on swordforum years ago and had wanted to see more. I don't have enough knowledge of corrosian of metals to make even a guess on the metal of those guards. Earlier in this topic we had a discussion about whether or not the sword shown on the carving of Stilicho was of Iranian origin or not, and I could not see any similarity between it and the examples presented here. Well after reading "Rome and the Sword" by Simon James (who is also of the opinion that stilicho wears an Iranian sword), I'm not so sure anymore. 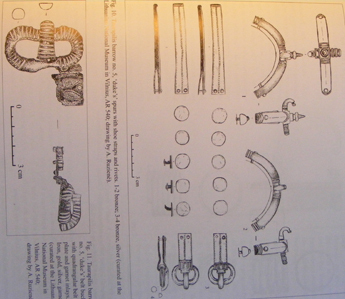 The main difficulty I had in the past with this arguement, was the pommel shape, but after seeing the reconstruction of an early Sassinid sword in Mr. James' book (p. 235), I can now see the similarity to Stilicho's sword. Now I'm not saying that I'm entirely convinced, but I can see the possibility. 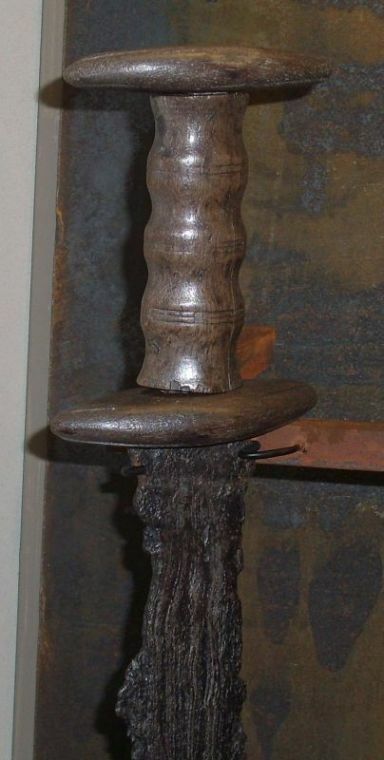 As for the sword in the carving of Honorius, to me it still looks like a Behmer type 1, with a strange pommel cap. Oh and at the top of this page Paul Hansen offered to share some of his pics of the the Krefeld Gellup swords, So Paul, I would like to take you up on this kind offer if it still stands. Thanks in advance. The main difficulty I had in the past with this arguement, was the pommel shape, but after seeing the reconstruction of an early Sassinid sword in Mr. James' book (p. 235), I can now see the similarity to Stilicho's sword. Sounds interesting! Can you post a scan? Best to PM me your email address. Otherwise I have to shrink the pictures which will cost some details.